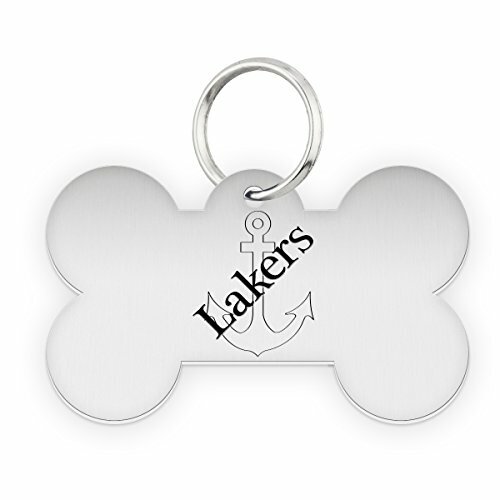 High Carbon Stainless Steel - High Quality and Durable pet ID tags that will not wear out. This collection is designed to be worn 24 hours a day and hold up to whatever your dog can dish out. Both the dog bone and dog tag shapes display the logo of your favorite college or university on one side and your dogs name and your contact information on the other. This is the last tag you will ever need to buy. This tag measures 1.5" wide by 1" tall. The college logo is on the front and the contact information is on the back. Brush finished surface. The tag hangs horizontally on the collar and a little lighter weight metal than the dog tag style. If you ever experience a problem with one of our pet tags we will replace it. No questions asked.